Fuchsia is a handwriting rule booklet and it is named after its fuchsia base line. File sets include one fully ruled file and one half ruled file. Print Fuchsia files back to back, stack them and fold them down the center. Bind fuchsia with staples or by sewing. 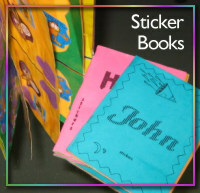 A cover is optional but feel free to be creative with decorated or plain card stock cut to size. The Fuchsia Booklet is available in 2 rule heights and a second rule style. The first set of files have the 3/8 inch rule. This set has a 1/4 Inch rule, or just under; your printed results might differ. I left out the top blue line in this set. The rule height is based on the 1/4 inch rule. Quarter sized booklets are ideal for little bits of work. We used them for both educational and motivational purposes. I used the sticker books to encourage my children. They could choose a sticker for positive reinforcement under certain circumstances. 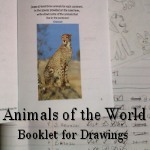 A Booklet for Drawing Animals - Animals of the World is a printable 1/4 sized booklet that has 4 pages for each continent. For each continent, the student should list a few animals on the continent's list page, and at some point, draw at least 3 of the animals.